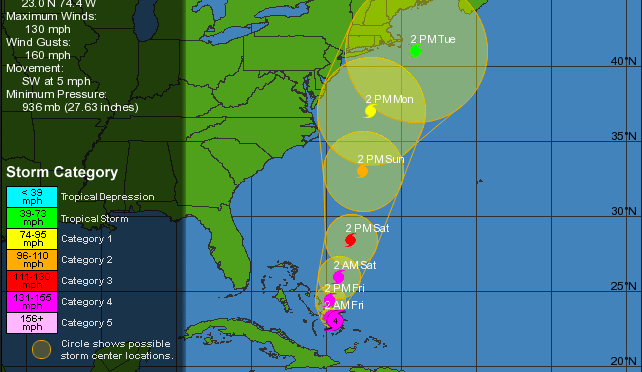 As of this afternoon, projections are that Hurricane Joaquin will stay just off the Eastern seaboard, and will be downgraded to a tropical storm by the time it nears New York Monday night. Nevertheless, its path has so far been hard to predict, and it’s always better to be prepared. 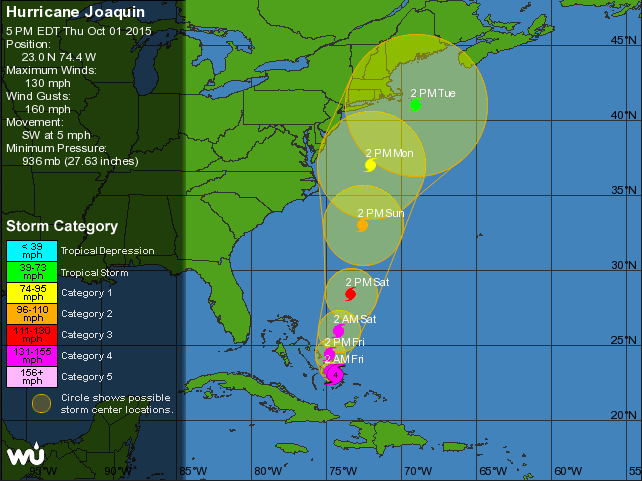 Projections for Hurricane Joaquin as of 5pm Thursday. East River General Manager Harold Jacob sent the following email this evening, highlighting the installation of the coop’s generators behind buildings 2 and 3. These generators were purchased after 2012’s Sandy knocked out power for days, and should provide enough energy to keep the coop’s water pumps running as well as lights in the hallway and stairs in the unlikely event that Joaquin creates the same storm surge. If you happen to have been watching the news or listening to the radio, you have certainly heard of a possibility of a hurricane hitting New York. New York has been hit by many hurricanes in the past with only minor damage. Only since Hurricane Sandy have we become more proactive and vigilant. Here are some of the steps that the Board and Management have taken. We have installed the portable generators that, in case of a blackout, will operate our hallway and stairwell lights, compactor rooms, and water pumps for you to have the water in the apartments. We have purchased 200 sand bags. We will open the Community Room (477 FDR Dr./M-Section) for people to be able to charge their telephones. The Maintenance Department will be fully functional. We are also bringing in additional boiler room and maintenance staff to operate the generators. These are outdoor generators and they are designed for inclement weather operation. We will keep them covered until we need them. We also kindly ask you to make sure that drains on your balconies/terraces are clean, and if not, please call the Maintenance Department to have it done. Also, please do not leave loose furniture on your balconies/terraces, we do not want them to be blown off. On a personal note, if you need any provisions (water, bread, batteries, etc. ), remember, it is your personal responsibility to go shopping. Please do not wait until the last minute, it may be rough for a few days. I live in the complex and even though it is a holiday I will stay in contact to make sure that any decision to be made, will be made. I am hoping that the storm is overrated. We have prepared for everything based on our past experience, hopefully, that will suffice. We believe we are as prepared as we can be.